The Star Spangled Music Foundation is pleased to offer a free series of historical sheet music arrangements of “The Star-Spangled Banner” and related songs in celebration of the anthem’s bicentennial. In partnership with the Smithsonian’s RaiseItUp! Flag Day celebration, we are happy to recommend the 1918 “Service Version,” the same edition recommended by the 1942 Code for the National Anthem of the United States. Click the image above to download your free copy of the Service Version in B-flat. 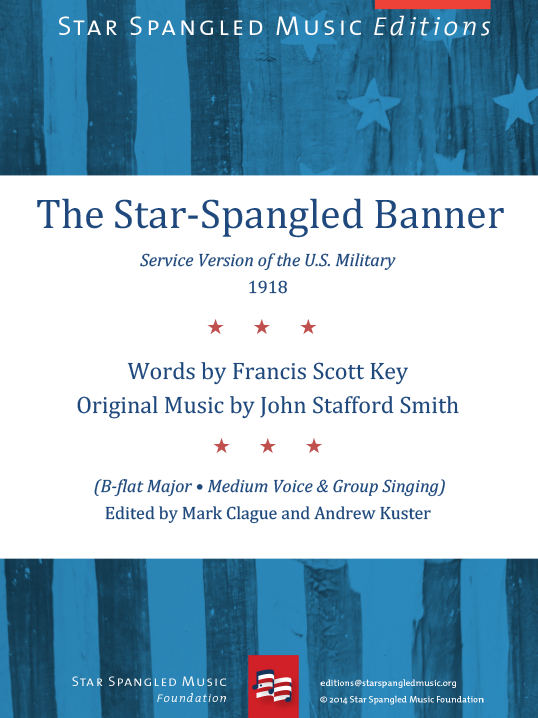 See our Star Spangled Music Editions page for other historic arrangements and order your own copy of our commemorative Star Spangled Songbook (available Aug. 2014). Please consider a donation to support the work of the Star Spangled Music Foundation.